This is a tool for assessing sources of occupant presence data—a record of where, when, and by whom a building is occupied—in relation to potential energy management strategies for commercial buildings. 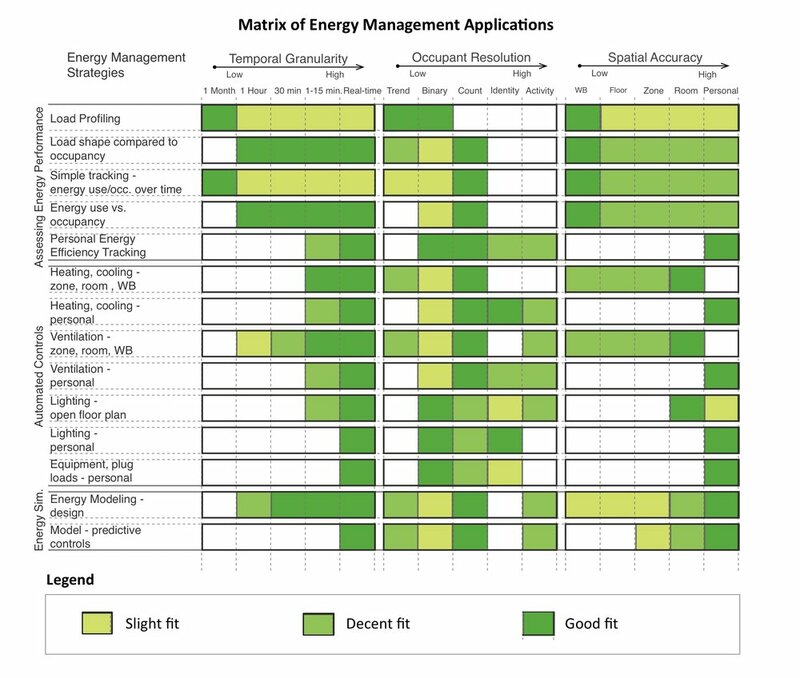 The first and second images are charts of characteristics of energy management strategies and occupant presence data sources. With the use of the two charts, an energy manager can assess the compatibility of a particular occupant presence data source with energy management strategies by choosing one row from the chart of occupant data sources, in this case wireless network data, as shown in the third image, and overlaying it on top of all of the energy management strategies, as shown in image four. Image five shows the completed assessment chart. The framework is further discussed in a paper in the conference proceedings of the 2012 ACEEE Summer Study of Energy Efficiency in Buildings. Wireless network data are discussed further here in the proceedings of the 2011 International Green Computing Conference. The framework is part of a larger research paper available here.